Today at MIDEM I presented the findings of an exclusive piece of research conducted by MIDiA Research in conjunction with MIDEM entitled ‘On Demand In Demand: Meeting The Needs Of The On Demand Fan’. The resulting report will be made available exclusively to MIDEM attendees and also to MIDiA Research subscribers. Here are some highlights. 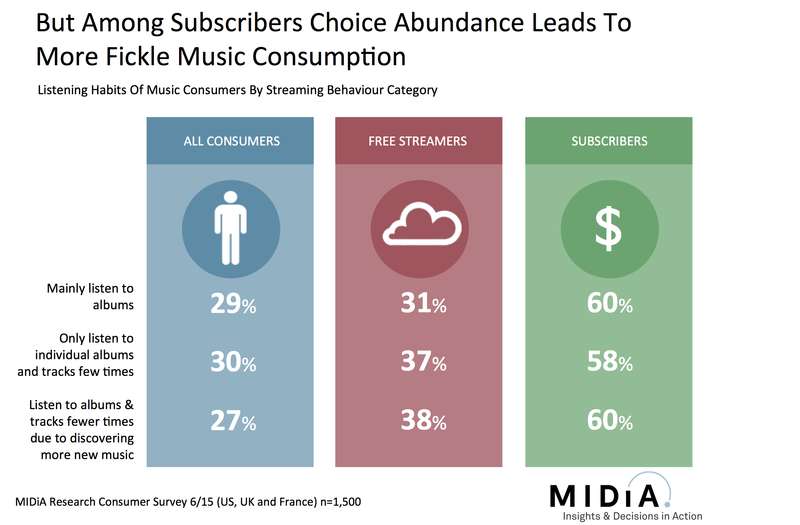 Streaming is the way in which people engage with music and is creating fundamental behavioural shifts among subscribers emerging that point to the future of music consumption. The abundance of choice represented by 30million tracks is leading to shallower engagement, especially among subscribers. 58% of subscribers report listening to individual albums and tracks just a few times while 60% are doing this more than they used to because the are discovering so much new music. With CDs and downloads the buyers typically listened many times over because a) they had paid for the release and b) it was the only new music they could listen to on-demand. With streaming no such barriers exist. Users can discover, sample, bookmark / like / favourite / add and then move on. Ironically the better that discovery tools function on streaming services the more this trend will exacerbate. The result is more people are listening to more music, so artists have wider reach, but they are being listened to fewer times by any single person. So total listening volumes are up but the depth of engagement with the majority of those listeners is low. So choice abundance is leading to casual fan relationships. This wide rather than deep approach is great value for music fans and for labels and publishers it translates into revenue diversified across their rosters, often with strong focus on more profitable back catalogue. But for an artist this means more people listening to your music but fewer times. Artist – fan relationships are moving from long term liaison to short term flings. The implications for the long term careers of artists are profound. On the surface more people listening but less frequently may equate to a net neutral impact on total listens but it means that listeners are not developing the same depth of relationship with individual artists that they did in the era of music sales. The foundations for fandom at scale are weakened. Listening to 30 albums once drives the same streaming revenue as listening to one album 30 times but lays entirely different fan foundations. Acts that can still sell out tours 10 years after their last chart hit can do so because even though much of their audience has aged out of fandom, there were so many of them initially that the decade old remainder is still big enough to be successful with. The 10 year outlook for streaming era artists with a large body of casual fans but small base of dedicated fans is much bleaker. It is no coincidence that we are already in the age of festivals, for these are little more than the playlist writ large as a live event. The future of live will be much more about festivals and multiple act tours which in turn means artists will end up with a smaller slice of revenue. Another implication of the shift from sales is that sub-standard and mediocre music will not have the safety cushion of dissatisfied purchases. Great marketing and a solid lead single might be able to convince people to buy a poor album but to date there is no technology that can trick them to listen to albums they don’t like. This streaming Darwinism may seem dystopian but there is simply too much music of sub-par quality coming to market. Which makes it difficult for quality to cut through the clutter. Streaming is rewriting the rules at a rapid pace and though the transformation can at times feel daunting resisting is not a strategy. Change can either be something that happens to you or something that you grab hold of. The music industry is poised on the verge of an entirely new chapter in its evolution nut what is clear is that the clock cannot simply be turned back. Some real gems in this one, Mark. The shallow fan engagement with artists is, in my opinion, the single biggest problem with the industry today. The highly engaged superfan has always been a significant source of revenue in the industry, but, as your article points out, this demographic is largely being ignored as everyone chases after pennies. And I understand why: creating and maintaining real fan engagement is hard. Most artists want to make music – not do social marketing and labels are in the “spray and pray” mode right now. Great article. I don’t have any major insights to add, but the behavior you describe is certainly true in my experience. I’m a paying subscriber and most of the time an album-first listener. I’ll generally check out something like 3-6 new albums a week now, depending on releases and available time. In this environment, an album I finish is pretty good, one that makes it to 3 plays is one of the best of the month, and one that gets a half dozen plays or more and actually holds my interest past the next week of releases is liable to make my personal top 10 for the year. On the upside for the music industry, I was almost totally unengaged from music a handful of years ago, as my album hit rate as an adult – no matter what recommendation method I used – simply became too low to justify $10 per try. Now I manage to find something new I like reasonably well every week or two, which is more than enough to be worth the subscription fee. It does seem that festivals are becoming ever more powerful in this setting. If you want to tour on your own, you had better put out multiple strong albums in a row and absolutely kill it live, enough to be in the top few percent of acts that get good internet word of mouth going about their performance abilities. I appreciate any effort to reframe the conversation around what scale of fandom is necessary to support career artists who are not working with mass-audience assumptions. Yes, there’s a lot of mediocre music out there, as there always has been. But mediocrity doesn’t correlate to low play counts. This should be evident, as plenty of mediocrity is hiding in plain sight on the pop charts. The analytical error that leads to this mistake is the same error that most of the digital services have made in the structure and design of their compensation models. It’s the assumption that the frequency of wanting to listen to something can stand in as a proxy for its relative value to the listener. Under scrutiny, this assumption is untenable, when you think about how listening works differently from artist to artist and fan to fan, listening environment to listening environment. It was brought it to my attention that this blog focuses on cheerleading for Spotify. But, that it is also informative. The problem with blurred lines is that the cost could be big in the end. Major label A&R strategy has skewed towards pop which, if you’re not a fan, can seem to be manufactured, cynical and mediocre. The nature of media of all types is that it is hit driven. So we are never going to get away from a place where when labels spend big on marketing mediocrity it scores big. But the days of mediocre middle ground music getting more revenue than it should are gone. That though does not mean that niche cannot prosper. In fact if you follow the logic of the findings niche music that people love will be played many many times over by individuals. So they will go narrow and deep. Niche but good music has no worries about building deep fan relationships. The problem though is that streaming licensing doesn’t support that type of music well yet commercially. If I spend all week listening to a metal core act, the majority of that 9.99 will still end up going to the likes of Katy Perry etc because at a service level they account for the majority of listens. So what we need is a user centric licensing model where payments are attributed based on individual listening behaviours not service level. Service level licensing is a legacy of analogue radio licensing. Now we have sufficient data capabilities to record and payout on user level behaviour. I’ll b writing about this next week. Great advice here. As technology changes the way people enjoy music, we as an industry have to change how we do things to keep up.Thanks for sharing this insight! Mark, I agree that value being calculated as a percentage of total plays across the service doesn’t make a lot of sense for interactive services (it makes more sense for non-interactive). But I’m afraid a shift to per-user payouts really doesn’t solve the fundamental problem if play-count-as-proxy-for-value is left intact. I’ll give you a concrete example from my own listening: Two records I love from the past year are Nedelle Torrisi’s “Advice From Paradise” and Spenking’s “Good Blood, Bad Blood”, both released on a small label called Ethereal Sequence. Both are extremely finely crafted albums from artists whose work I have long enjoyed. Nedelle’s record is breezy, emotional pop music, full of bright melodies & primary color emotions. Spenking’s is hushed, otherworldy, skeletal folk. I listen to the Nedelle record about 15 times as much as the Spenking record, which only makes sense for certain moods with complete attention; savored like a fine wine. If I listened to it all the time, I’d probably be stuck in a daze of existential terror and no fun to be around. But I value these records both and I want a streaming model that reflects that, rather than one that assumes the Nedelle record is worth 15 times as much to me. Both of these artists are probably “niche” by the standards of mass culture. Perhaps they would benefit a bit from a shift towards per-listener payouts? But the system would still be weighted towards the kind of art that encourages lots of repeat listens. It’s not a tenable assumption that even beloved niche records get played “many many times over;” some will and others won’t. Play count just isn’t a reliable metric for depth of engagement. In other words, physical/downloads preserves a market for records like Spenking’s in ways that streaming architects haven’t figured out yet. (And this is likely a function of who’s at the table at the service design stage.) Bandcamp’s hybrid streaming/download model tries to account for this with upfront payment plus free streaming listening forever through their app. Couldn’t there be more experimentation here? Since the inception of my paid subscription to Spotify I have attended more live shows than ever before. Seeing an artist that has a great album in an intimate venue I find both enjoyable and rewarding. I always try to support the artists I see live whether that be through twitter posts to help them gain further audience traction or by buying their CD while at the show. If they sign the CD I keep them, otherwise I give the CD away hoping some one will become a fan too. The Independence Bowl is played at Independence Stadium in Shreveport, Louisiana. life with. Lett him sense that you’re increasingly emotionally independent of him.